Diffusion tensor imaging (DTI) fully characterises water molecule mobility in vivo, allowing an exploration of fibre tract integrity and orientation in the human brain. Using DTI this study demonstrates reduced fibre coherence (anisotropy) associated with cerebral infarction and in the corticospinal tract remote from the lesion, in five patients 2 to 6 months after ischaemic stroke. The study highlights the potential of DTI to detect and monitor the structural degeneration of fibre pathways, which may provide a better understanding of the pattern of clinical evolution after stroke. Wallerian degeneration—the anterograde degeneration of axons and their myelin sheaths after proximal axonal or cell body injury—commonly follows CNS pathology. Some studies using MRI suggest that the presence or absence of wallerian degeneration may influence the clinical outcome after stroke.1 However, conventional MRI is only abnormal in a proportion of cases,2 and cannot easily quantify the extent or severity of fibre damage. Newer MRI methods that are sensitive to water diffusion can be used to study aspects of tissue structure and orientation not accessible to conventional MRI. Magnetic resonance diffusion imaging has recently generated considerable interest due to an ability to disclose early pathophysiological changes in acute stroke,3 but less attention has been paid to structural changes in fibre tracts beyond the area of infarction. It is generally accepted that a full description of water molecule diffusion requires the determination of the diffusion tensor, a nine element mathematical matrix quantity from which indices describing the magnitude (diffusivity) and directional bias (anisotropy) of water molecule motion may be derived.4 It is possible to estimate the diffusion tensor by measuring changes in the magnetic resonance signal collected with diffusion sensitising gradients applied along at least six non-collinear directions.4 In brain regions where the diffusion of water varies significantly with direction, the tissue exhibits the property of anisotropy; by contrast, regions where diffusion is similar in all directions have low anisotropy (and are said to be isotropic). In an axon cylinder water diffusion is faster along the axon than across it, probably due to the presence of directional subcellular structures including the axonal membrane and the neurofilamentary cytoskeleton which behave as barriers to diffusion.5 As intact fibre tracts are composed of collections of similarly oriented axons, they generally exhibit high anisotropy.6 Anisotropy measurement therefore shows promise in detecting the degree of fibre damage in diseases affecting white matter.7 Furthermore, diffusion within each volume of tissue (voxel) may be most fully and naturally described by three mutually perpendicular eigenvectors, the magnitudes of which are given by three corresponding eigenvalues; the eigenvalues are the three principal diffusion coefficients measured along the three (intrinsic) eigenvector directions which define the local “fibre” frame of reference for that voxel.6 The direction of fibres is thus given by the eigenvector of the largest eigenvalue of the diffusion tensor, allowing in vivo maps of white matter fibre trajectories to be constructed.6 We used DTI to investigate structural changes (including in diffusivity, anisotropy, and fibre direction) within the infarction and associated descending corticospinal tracts in five patients after stroke. Diffusion tensor imaging of a 45 year old man 2 months after right middle cerebral artery territory stroke. (A), (B), and (C) show different axial levels through the brain (left side of figure). The coronal images (right side of figure) provide direct visualisation of the descending corticospinal tracts; the horizontal yellow lines show the locations of the axial slices. The grey scale images are maps of fractional anisotropy (FA), one of the anisotropy indices derived from DTI. Overlaid on these are the principal eigenvectors (red lines), which depict the local fibre direction at each voxel in the image.6 For greater clarity, the eigenvectors have been given a threshold so that only those in regions of anisotropy>0.5 are displayed. The large open arrow in (A) indicates the infarct, which has reduced anisotropy (dark pixels). The small closed white arrows in (A), (B), and (C) indicate the location of the damaged corticospinal tract in which anisotropy is lower than on the opposite side. In the coronal images (right side of figure) the intact corticospinal tract on the left side of the brain has high anisotropy (bright pixels) and coherent fibre orientation (red lines). This is by contrast with the loss of tract anisotropy and direction on the right side of the brain ipsilateral to the infarct. In all images the right side of the brain is to the left of the panel. We used DTI (echo planar imaging (EPI) TE=78 ms, 96×96 matrix, four diffusion b values increasing from 0 to∼700 smm-2applied in seven non-collinear directions) and conventional T2 weighted MRI (TR=2000, TE=120, matrix 256×256) to study five patients (three men, two women; mean age 58 years) with resolving hemiplegia 2 to 6 months after middle cerebral artery territory infarction (four right sided; one left sided), and five normal controls (three men, two women; mean age 37 years). All patients gave written informed consent to participate in the study, which had been approved by the joint ethics committee of the Institute of Neurology and the National Hospital of Neurology and Neurosurgery. The diffusion tensor was estimated, from which the mean diffusivity (MD), a directionally averaged measure of diffusion, and fractional anisotropy (FA), a quantitative index of anisotropy were calculated.6 The MD and FA were measured in regions along the corticospinal tracts (internal capsule, cerebral peduncle, and pons) and within the region of infarction, and in matched contralateral regions. Regions were defined on the EPI images acquired in the absence of diffusion sensitisation with reference to the conventional MR images, and then transferred to maps of MD and FA. Statistical comparisons between the right and left sides were performed in patients and controls using the Mann-Whitney U test. Maps of the principle eigenvector were generated to depict the local fibre direction at each voxel using software developed by one of us (GJMP). T2 weighted MRI showed high signal consistent with cerebral infarction in all patients, but only minor changes (hyperintensity) in the affected corticospinal tract of one patient. Using DTI the infarct was demonstrated in each case as an area of reduced FA and increased MD. The ipsilateral corticospinal tract showed reduced anisotropy on axial and coronal images (figure) but no visible change in diffusivity. Eigenvector maps in patients showed loss of the coherence of the eigenvectors in the tract ipsilateral to the stroke, by contrast with the integrity of the descending corticospinal tract on the opposite, unaffected side (figure). Quantitative measurements of FA and MD confirmed statistically significant diffusion changes in the infarction and the ipsilateral descending corticospinal tract compared with matched contralateral regions (table). Infarct regions showed reduced FA (mean 0.29v 0.48, p<0.001) and increased MD (mean 1.75 v 0.91, p<0.001). In the corticospinal tract distal to the infarct, DTI showed significantly reduced FA (overall mean 0.61 v 0.73, p<0.001), but without significant change in MD (overall mean 0.96v 0.95, p=0.88); this pattern was confirmed in each patient considered individually. In control subjects no significant differences were detected between the right and left sides in FA (overall mean 0.83 v 0.82, p=0.51) or MD (overall mean 0.92 v 0.92, p=0.63) at any level examined. Our results have shown reduced FA with preservation of MD in the corticospinal tract distal to cerebral infarction. This pattern of diffusion changes is similar to that found in experimental animal models of wallerian degeneration in the peripheral nervous system.8 Wallerian degeneration involves breakdown of the myelin sheath and disintegration of axonal microfilaments.9 Loss of integrity of these directional structures is consistent with our finding of reduced anisotropy in the corticospinal tract ipsilateral to cerebral infarction. Although disruption of myelin and axons might be expected to increase the MD of water molecules, an accumulation of cellular debris from the breakdown of axons may hinder water molecule motion.8 Furthermore, wallerian degeneration is characterised histologically by glial proliferation,9 which would also be expected to restrict the mobility of water molecules. Both of these factors may contribute to the relative preservation of MD in the affected pathways. Replacement of the intact anisotropic microstructure by disorganised glial proliferation may also underlie the marked reduction in FA we have demonstrated in affected corticospinal tracts. The primary infarct showed a different pattern of DTI abnormalities from those found in the associated corticospinal tract. Large MD increases were seen in all patients compared with matched contralateral brain regions (group mean 1.75 v 0.91, p<0.001), consistent with previous reports of increased water diffusion after the acute phase (>10 days) of cerebral infarction.10 Moreover, anisotropy was markedly reduced in the infarct by comparison with contralateral regions (FA group mean 0.29 v 0.48, p<0.001), a finding to our knowledge not previously reported in human subjects but in keeping with experimental data in animals after transient cerebral hypoxia-ischaemia showing reduced white matter anisotropy.11 In a longstanding cerebral infarct it is thought that cell lysis and loss of normal tissue architecture expand the extracellular space, allowing water molecules to diffuse more freely.12 These changes would account for the increased diffusivity and reduced anisotropy that we have demonstrated in regions of infarction. The difference in diffusion properties between the primary lesion and the degenerated tract (reduced FA with increased MD in the infarct; reduced FA with preserved MD in the corticospinal tract) may allow DTI to distinguish between the primary lesion and associated wallerian degeneration (not possible on conventional MRI). A second advantage of DTI is the ability to generate eigenvector maps, which provide a striking visual comparison between the trajectories of the affected and the intact corticospinal tracts (figure). Finally, the finding of minor T2 weighted signal change in only one patient, by contrast with DTI abnormalities in all five cases indicates the higher sensitivity for DTI to detect wallerian degeneration. This preliminary study indicates that DTI can visualise and quantify changes in the integrity and orientation of white matter tracts transected by a focal ischaemic lesion that are consistent with wallerian degeneration. Our findings highlight the potential of DTI to detect and monitor the structural changes in cerebral infarction and associated degeneration of fibre pathways; longitudinal DTI studies may provide a better understanding of the pattern of clinical evolution after stroke. (1997) MRI demonstration in various intracranial lesions and its clinical implications. J Neurol Sci 146:103–108. (1998) Wallerian degeneration of the pyramidal tract does not affect stroke rehabilitation outcome. Neurology 51:1613–1616. (1999) New reasons for early use of MRI in stroke. Neurology 52:1733–1736. 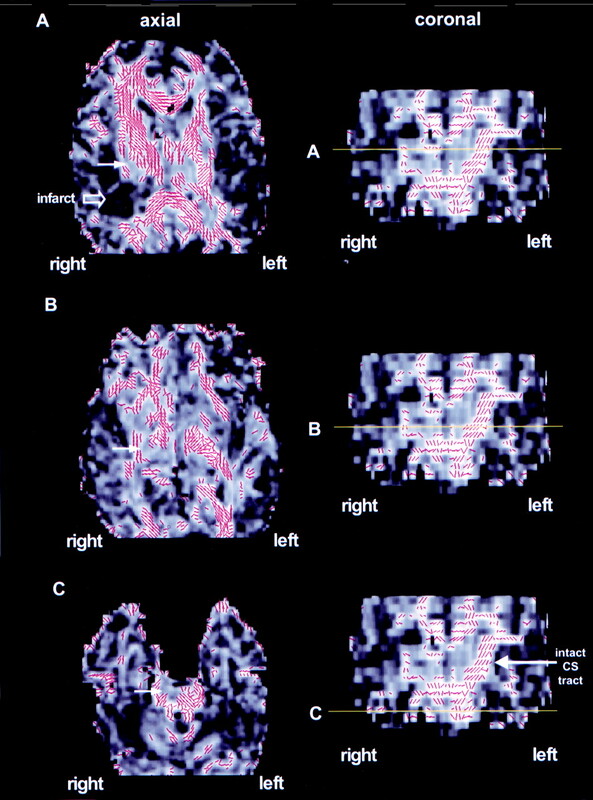 (1996) Diffusion tensor imaging of the human brain. Radiology 201:637–648. (1999) Diffusion tensor imaging of lesions and normal-appearing white matter in multiple sclerosis. Neurology 52:1626–1632. (1996) Changes in water diffusion due to wallerian degeneration in peripheral nerve. Magn Reson Med 36:627–631. , eds (1997) Greenfield's neuropathology. (Arnold, London), 6th ed. pp 104–107. (1997) Clinical utility of diffusion-weighted magnetic resonance imaging in the assessment of ischaemic stroke. Ann Neurol 41:574–580. (1997) Anisotropic water diffusion in white and gray matter of the neonatal piglet brain before and after transient hypoxia-ischaemia. Magn Reson Imaging 15:433–440. (1994) Magnetic resonance imaging of evolving focal ischaemia. Stroke 25:1252–1262.